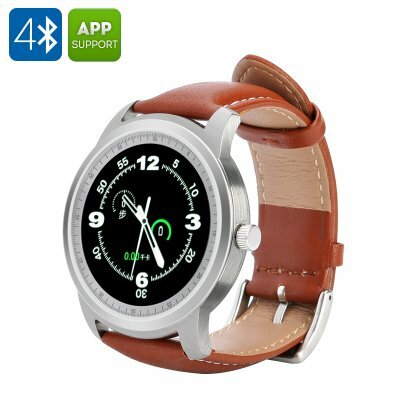 Successfully Added IMACWEAR Q1 Smartwatch - IP57 Waterproof, 1.3 Inch Display, Pedometer, Heart Rate, Music, Remote Camera Trigger (Silver) to your Shopping Cart. The IMACWEAR Q1 is a stylish smartwatch a stylish accessory with a 1.3 inch round display, IP57 waterproof rating, pedometer, heart rate monitor and more. The IMACWEAR Q1 may look like “just a watch”, but don’t lets the classic looks fool you. The smartwatch comes with lots of functionality and will help you get important updates, watch your health, exercise and more. Coming with Bluetooth 4.0 the smartwatchand will communicate smoothly with your smartphone. After pairing, you will be able to get notifications, make and receive calls, use it as a remote camera trigger, music player and more. You can even pair the watch with your iPhone (OS version 7.0 and above) and use Siri for handsfree voice commands. With plenty of features the IMACWARE Q1 will help that will help you keep to an active lifestyle and monitor your health. You will have the heart rate monitor, pedometer that will inspire you to get active, a sleep monitor for a good night’s rest and a sedentary reminder to get you out of the office and into the action. The watch comes with a simle and easy-to-operate user interface. You will have a 280mAh battery that will last 72 hours on standby and offer 1 hour of continuous talk time. Plus, thanks to the IP57 waterproof rating, your smartwatch won’t mind a few splashes or being worn in the rain. The IMACWEAR Q1 Sports Smartwatch comes with a 12 months warranty, brought to you by the leader in electronic devices as well as wholesale smartwatches..